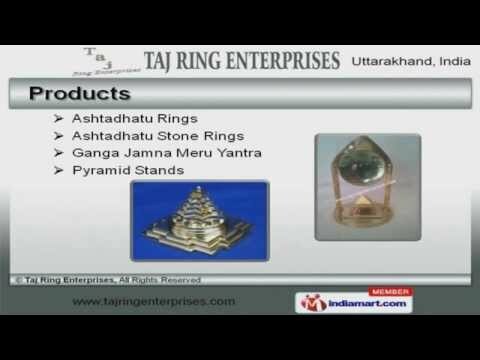 Welcome to Taj Ring Enterprises, Manufacturer and Supplier of Pooja Items and Asht Dhatu Rings. The company was established in 2011 at Roorkee. International quality standards and Rigorous quality checks make us unique in the industry. Customized solutions, large production capacity and industry leading prices make us the first choice of our clients. We offer a vast range of Ashtadhatu Rings, Ganga Jamna Meru Yantra and Pyramid Stands. Our Pyramid Tortoises, Stone and Rashi Lockets are best in the industry amongst others. We offer Sai Baba Tortoises, Kachua and Swastik Yantra that are widely acclaimed in the market. God Kavasam, Meru Chakra and Spotlights offered by us are available at affordable prices. Along with that we offer Kachua Yantra for Shops and Stone Bracelets that are some of our best selling products. We also provide Kuber Vyapar Pyramids, Punch Dhatu Rings and Pooja Items that are a class apart.